Have you been thinking about returning to school, changing careers, or re-entering the job market after time away? Whatever your situation, your first step should be to discover what kind of educational program will best help you attain your goals. Here are some tips to help you get started. 1. Assess your career goals and situation. Look at your own work history, interests, and abilities, and identify what you enjoy doing. Which past achievements have given you most personal satisfaction? Think about your own definition of success. For example, how important is it for you to feel like you’re contributing to society, engaging in a challenging profession, or making a specific amount of money? Are you seeking to update your current skills or aiming for a total career change? 2. Explore some career ideas, and gather information about them. Talk to people who are in a field that you’re interested in. Ask what they enjoy most about their jobs, and what their work is like. How did they get to the position they’re in – with what sort of education, skills, experience? What are the advancement opportunities and job availability in their field? Other sources of career information include the Internet, books, professional associations, and career information databases. 3. Gain some experience in the field of your choice. You could take a course or workshop in the field: talk to the instructor and interact with the other students. You might be able to “job-shadow” someone. Get involved in volunteer work, or find a part-time job in the field. Take advantage of these settings by talking to your co-workers, bosses, and clients or customers. 4. Implement your career and educational choices. If you will need courses or a college degree before you can enter your career of choice, this is the time to shop for the school or college that can provide you with the appropriate education. 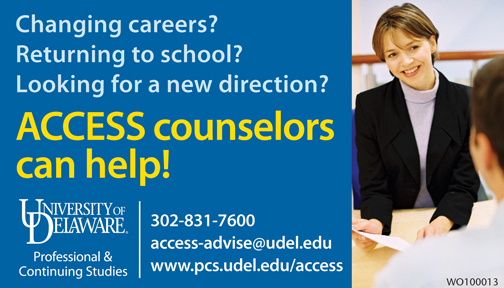 The University of Delaware’s Division of Professional and Continuing Studies can assist with all stages of the career exploration process through its ACCESS Center. For information, or to make a free appointment with an academic advisor, call 302-831-2741 or write to access-advise@udel.edu.